To travel through the ancient landscapes of Antrim and Newtownabbey is to journey into a place with a rich and intricate history. Here myths and legends have the power to bring you closer to the past and to yourself. Discover the Black Face of Stone, set high on a wall at Shane’s Castle - and let’s hope it’s still there - the fate of the O’Neill clan depends on it. Learn about the only truly European war ever fought on Irish soil at the White House on the shores of Belfast Lough or even seek out the mysterious "Holestone" and touch hands with your loved one through its ancient opening; then see if it still holds its mythical power to impart happiness! The Round Tower in Steeple Park is all that remains of a once great monastic settlement in Antrim. Measuring 28 metres high, the tower was built in the 10th or 11th century and probably served as a defensive stronghold in times of trouble. Lough Neagh is the largest freshwater lake in the British Isles and according to legend, it owes its existence to the famous Irish giant, Finn McCool. The story tells us that Finn was chasing the thieving Scottish giant, Benandonner, out of Ireland. The huge Scot could run faster than Finn and soon he had almost reached the coast. Fearing his rival would get away, Finn scooped up an enormous handful of earth and rocks and threw it towards the fleeing giant. As he didn't know his own strength, he threw it too far and Benandonner escaped. Local legend tells of a witch who was so unhappy over the building of the Round Tower that she jumped off the top to express her annoyance. She landed on a large boulder, leaving in it the impressions of her knee and elbow. To this day the rock is known as the ‘Witch’s Stone’. It sits next to the Round Tower. The great pile of rocks and clay flew far out into the sea, where it became the Isle of Man. A giant hole remained in the place where Finn had scooped out the rocks. Gradually the hole filled with water to become… Lough Neagh. There are many myths and legends surrounding the origins of Lough Neagh. According to one tale, a well once stood in the centre of the land now covered by the Lough. A long time ago, Ireland had many kingdoms with fine houses, strong castles and tall towers. Deep within one of these kingdoms was a magical spring of bright, fresh water. The people of this kingdom became greedy and began to rob and cheat their neighbours. Its waters were supposed to possess miraculous healing powers and were said to be under the influence of the fairies. An old woman looked after the well and it was her job to close the gate to the well after all the visitors had left. One day she forgot to do this and the water overflowed and followed the terrified woman as far as Toome. There the local people threw her into the water for being so careless and she drowned. The overflowing ceased and the water that remained formed Lough Neagh. At first the spring watched and did nothing, but then it rose up in anger and drowned the entire kingdom. Even now, on certain days, it is said that the towers of this lost land can be seen shimmering far beneath the waves of what became known as Lough Neagh. The O'Neill family traces its history back to the very beginning of Ireland's story. They were kings of Ulster for one thousand years and this castle, built in 1345, was their home. Originally called Eden-duff-carrick, its name was changed to Shane's Castle by Shane MacBrien O'Neill in 1722. In 1816, a large addition to the castle was in course of being built when it was destroyed by fire. The entire buildings were ruined, with only the fortified esplanade and a grand conservatory remaining. Shane’s Castle is said to have its very own banshee and the story of how it came about goes like this. In olden times, a member of the O'Neill clan went to help McQuillan in one of his raids. When he arrived, he saw a cow with its horns tangled in a hawthorn tree. This tree was considered sacred by the fairies, so no one would cut its branches to release the poor animal. However, O'Neill cut the branches and freed her but there was a price to pay. When he returned home, he found that his daughter, Kathleen, had been carried off by the "wee folk" to the bottom of the Lough. On one of the eastern walls there is a curious female figurehead, carved in stone, with a sad expression. It is known locally as the Black Face of Stone. Some say that this figurehead was brought from the east and is much older than the ruins among which it stands. Folklore states that the O’Neill family will come to an end if ever the face should fall. From then onwards, when evil threatened a member of the family, her banshee shriek could be heard all along the lough shore and from the ruined walls of the castle. Legend even blames the banshee for the fire which destroyed Shane’s Castle in 1816. The Holestone is an ancient Celtic stone which stands between Parkgate and Doagh. What makes it unusual is the hole, about the size of a small clenched fist, which goes all the way through the stone. On the shores of Lough Neagh, at Churchtown Point, lie the ruins of a 13th-century Church and St Olcan's Shrine. Near the shore, a few yards east of the church, is a holy well. The amber pebbles contained within the well are believed to have great healing powers bestowed by St Olcan. They were thought to protect women during childbirth, prevent men from drowning and save homes from fire and burglary. In the last century, emigrants to America believed that if they swallowed a pebble, they would sail safely across the Atlantic Ocean. Visitors have been coming to the Borough to see the Holestone since the 18th century. Some couples, looking for eternal love and happiness, undertake a traditional ceremony, where the woman puts her hand through the circular hole and her partner takes it. By doing so, they make a commitment to love each other forever. Donegore Motte, or ‘moat’, is one of the most prominent features in the landscape of County Antrim. Often considered an Anglo-Norman motte or castle mound, its origins may in fact date back to a much earlier ancient burial mound, built around 5000 years ago. Templepatrick takes its name from the Irish ‘The Stone Church of Patrick’. Legend has it that while St Patrick was engaged in his mission to Ireland, in the 5th century AD, he came to this area and baptised converts in an ancient holy well. He then founded a church in the centre of the graveyard, where the mausoleum stands, inside the grounds of what is now Castle Upton. The meaning of the name ‘Donegore’ is unclear: it may be Irish for ‘the sharp fronted fort’ or ‘the fort of goats’ or intriguingly ‘the bloody fort’. The ‘bloody’ name comes from a belief that people suffering from plague were driven there to die to prevent the disease from spreading throughout the country. In the last century, blasting was carried out for a new limestone quarry. Within a few days the quarry was flooded and all the equipment destroyed! Some would say that the ‘wee folk’ were angry at these strangers for desecrating the Chapel of St Patrick. If your travels should take you to Kilbride Graveyard in Doagh, there is an intriguing architectural curiosity which is worthwhile investigating. It is the morbidly named corpse house, or mort safe. Monkstown Abbey used to be one of the most important pilgrimage sites in Ulster. And according to tradition, it is where Fergus, the Ulsterman who became the first King of Scotland, was buried over 1500 years ago. This large stone vault was built in the early 1830s when the threat from body snatchers was at its height and was used to store bodies until they were no longer 'fresh' enough for body snatchers to make money from them. The story goes that Fergus suffered from leprosy, and in AD 501, he travelled back to Monkstown, hoping to find a cure for his affliction. His boat got caught in a storm and sank near the entrance to Belfast harbour. Fergus drowned and his body was washed up near Whitehead, and he was buried at Monkstown Abbey. 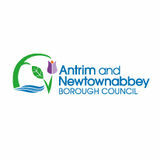 Antrim and Newtownabbey has a long and intriguing history. Its story stretches back over 7,000 years, long before even the pyramids were built. Each generation has left its mark on the landscape, leaving an imprint of buildings and monuments that reflect the ever-changing patterns of settlement, trade, conflict and industry. So why not take a day out to steer a path through this ancient land of majestic beauty? Discover Bronze-age standing stones and try to unravel their enigmatic carvings. Climb a Norman motte for jaw-dropping views of Ulster. Step into rural Ulster in the 1800s at Sentry Hill or feel the heat of industrial archaeology at Pattersonâ&#x20AC;&#x2122;s Spade Mill. The choice, and more, is yours. Antrim Round Tower was built around the 10th century and is one of the finest towers of its kind in Ireland. It is 28 metres tall and was built as part of a Monastic settlement. In 1813, Antrim Castle was extensively remodelled and in 1818, the Barbican Gate was created as the final stage in this process, forming the main entrance from the town. The main entrance is some two metres above ground level, which suggests that the tower may have served as a defensive stronghold in times of trouble. Built in a similar style to the castle, it bears a number of interesting architectural features, including its fine battlement and neo-Tudor twin towers, which frame a great Tudor arch. Both the Gate and the Castle are believed to have been designed by the same architect, John Bowden of Dublin. Located next to the Round Tower is a sizeable boulder, known in folklore as the 'Witch's Stone'. The Council is currently consulting on a concept plan to open up the greater Steeple Site historic parkland to the community offering a wide range of recreational and leisure opportunities. The Barbican Gate fell into disrepair after years of neglect, but in 2005, major repairs were undertaken by the Council and it has now been restored to its former glory. Built in 1832, Patterson’s Spade Mill is the last working water-driven spade mill in daily use in the British Isles. It is a place where you can see history forged in steel; hear the hammers, smell the grit and feel the heat of traditional spademaking. On a clear day, this historic pre-Anglo/ Norman motte offers views of six Ulster counties. The "Motte" was believed to have been built upon a much earlier Passage Grave, dating back some 5,000 years. Built in 1596, All Saints Church is one of the oldest parish churches still in use and is one of the finest examples of Elizabethan architecture in Ireland. Situated in the graveyard of Castle Upton, this family mausoleum in the shape of a triumphal arch was designed and built by the renowned Scottish neoclassical architect Robert Adam. The church was burned by the Scottish army of General Monro in 1649 and was not repaired until 1720. The tower and spire of the church were erected in 1816 and the transept was added in 1869. This particular tomb was built in 1789. It is typical of Adamâ&#x20AC;&#x2122;s style with its classical urns, leaf swags and circular reliefs surrounding the arched door to the vault. It remains one of the finest examples of neoclassical architecture in Ireland. Inside there are many monuments dedicated to the Massereene family, some members of which are buried in vaults beneath the church. The churchyard contains the headstones of many prominent people, including Alexander Irvine. On the shores of Lough Neagh at Churchtown Point lie the ruins of a 13th century Church and St Olcan’s Shrine. Ram’s Island is located approximately one mile offshore from Lennymore Bay and Sandy Bay on the eastern shore of Lough Neagh. It is nearly one mile long by a quarter of a mile wide and is the largest island on Lough Neagh. Near the shore, a few yards east of the church, is a holy well which produces fine spring water and amber coloured crystals; these were thought to protect women during childbirth, prevent men from drowning and save homes from fire and burglary. Pilgrimages were made to Cranfield annually between 30 May and 29 June. Notable features of the island are a round tower and the ruins of the O’Neills’ 19th century summerhouse. Its remote wilderness and lost-in-time qualities make Ram’s Island a pleasant and attractive place to visit. A ferry service is available to take visitors to the island and around Lough Neagh (See P71). A rath is an ancient circular enclosure surrounded by an earthen wall, used as a dwelling and stronghold. Most were built between 700 and 1100 AD to house a farming family and perhaps some livestock. Shaneâ&#x20AC;&#x2122;s Castle is the family seat of the Oâ&#x20AC;&#x2122;Neills of Clanaboy. The Demesne is one of the most beautiful and well maintained in Ireland. Although the Castle has been in ruins since a fire in 1816, the remaining structure, including a unique Camellia House, is a striking feature on the landscape. The site has been used extensively in the renowned TV series 'Game of Thrones'. Bounded by Belfast Lough to the north and Lough Neagh (the UK’s largest expanse of fresh water) to the south, Antrim and Newtownabbey encompasses an enormous array of beautiful landscapes, peppered with charming towns and villages. So why not take to the road and discover all that this area has to offer? To help you on your journey, there are a range of carefully researched and beautifully presented audio trails and written guides. Whether you’re fascinated by early Christian heritage, the Ulster-Scots story, great gardens of the Borough, the unspoilt beauty of Lough Neagh or our rich architectural heritage, there’s a trail that will immerse you in Antrim and Newtownabbey and engage you in your subject. Lough Neagh Tours offer guests an opportunity to immerse themselves in heritage, history and hospitality around this unique lake - the largest in the UK and Ireland. Be one of the first to experience its untouched landscape, meet the locals and sample the unique charm and fantastic culinary delights. Join a Blue Badge tour guide and explore Randalstown’s patterns of the past. As you steer a path down through this fascinating historic town of majestic beauty, you will discover a town steeped in rich history and heritage dating back to the 18th and 19th Centuries. Tours include: • Craic ‘N Food & Drink Tour • Shane’s Castle Tour & Afternoon Tea (no transport) • Ram’s Island Tour • Lough Neagh Fisheries Tour And many more beyond the Antrim shoreline of Lough Neagh. Tour packages can be tailored for private group bookings on request. Tours depart from Belfast with pickup available locally on request. LOUGH NEAGH Covering 383 square kilometres, Lough Neagh is the largest freshwater lake in the British Isles and is one of the earliest known inland sites of prehistoric man in Ireland. It is generally shallow, with an average depth in the general body of the Lough of 9 metres (30 feet). The area around Lough Neagh is one of the most important bird habitats in Western Europe. A haven for wildlife and home to a wealth of flora and fauna, Lough Neagh provides a unique and valuable natural resource, offering a very productive ecosystem, which supports thousands of wildfowl and a large-scale eel fishing industry. BELFAST LOUGH Belfast Lough is a natural inlet of the North Channel that connects the Irish Sea with the Atlantic Ocean. Flanked by hills on its northern and southern shores, the sheltered waters of Belfast Lough are ideal for shipping, conditions which helped Belfast to thrive as a port in the 1600s. The later dredging of the Dargan Channel in 1830s allowed larger ships to enter the port and also facilitated the development of Belfastâ&#x20AC;&#x2122;s shipbuilding industry. The shoreline of Belfast Lough is home to a wide range of wildlife. Its mudflats are rich in oysters, cockles, snails and worms, which support internationally important populations of waders and wildfowl, including Brent geese and Redshank. A stroll along the pathways at Jordanstown Loughshore Park will let you enjoy the wildlife and scenery of Belfast Lough. Antrim and Newtownabbeyâ&#x20AC;&#x2122;s numerous parks and open spaces provide many birdwatching opportunities. The Borough's true birdwatching haven is to be found on the shores of Belfast Lough. The mudflats, lagoons, rocky shores and small sandy bays provide vital habitats to support this wildlife and the region has been designated an ASSI - Area of Special Scientific Interest. Some of the more notable species include Great Crested Grebes, Redshanks, Oystercatchers, Dunlins and Curlews. Whitehouse Lagoon is an excellent place to view shorebirds. Grebes and other wintering wildfowl can be seen from Macedon Point, Hazelbank and Loughshore Park. Lough Neagh and Lough Beg support bird species of national and international importance. Birds migrate here because of the area's mild winter temperatures and large expanses of unfrozen water offered by both loughs. You may see birds such as Mallard, Tufted Duck, Great Crested Grebe, Little Grebe and Mute Swan. The largest Common Tern colony is found off shore on the old torpedo platform during the summer months. Reaâ&#x20AC;&#x2122;s Wood is a wet woodland dominated by alder, willow and birch trees. In spring, the woodland has a good variety of birds, including Chiffchaff, Blackcap and Willow Warbler. In winter, Siskin and Redpoll can be heard as they actively search for food in the tree canopy. There are many wonderful parks and gardens throughout Antrim and Newtownabbey. The jewel in the crown is undoubtedly the beautifully restored 400-year old Antrim Castle Gardens; its Anglo Dutch canals, ponds and avenues provide a unique walkway into the past. There is also the Walled Garden at Greenmount. This dramatic and colourful formal garden dates from 1801 and forms a centrepiece at Greenmount College. Or why not enjoy the casual ease of Ballyrobert Cottage Garden; you might even pick up some ideas for your own garden in its nursery! If you enjoy relaxing by the waterâ&#x20AC;&#x2122;s edge, then you can choose between the fresh water delights at Antrim Lough Shore Park, on the shores of Lough Neagh, or the crisp sea air of Jordanstown Loughshore Park. There are great views, whichever way you look! WE HAVE 17 AWARD WINNING PARKS AND OPEN SPACES ACROSS THE BOROUGH. THESE OPEN SPACES HAVE BEEN AWARDED GREEN FLAGS WHICH IS AN INTERNATIONAL CERTIFICATION THAT RECOGNISES HIGH LEVELS OF MAINTENANCE AND EXCELLENT COMMUNITY INVOLVEMENT. VISIT ANTRIMANDNEWTOWNABBEY.GOV.UK/GREENFLAG FOR MORE INFORMATION. The setting for the garden is a 17th-century landscape, complete with the original cottage, barn and farm layout extending to sixteen acres. Sensitively integrating these elements is a six acre garden containing one of Northern Irelandâ&#x20AC;&#x2122;s most extensive collections of plants, laid out in intimate settings and sweeping borders to enthral the visitor. The Walled Garden, which dates from 1801, is a dramatic and colourful formal garden, set within one hectare of the pleasant Greenmount Campus just outside Antrim town. Features include a curvilinear style conservatory, a bronze sculpture, fountain and cascade. Visitors have the opportunity to relax and enjoy a cup of tea with freshly baked scones and tray bakes in the tea room. Ballyrobert Gardens is also home to a specialist retail nursery which is stocked with a wealth of cottage garden plants. Mossley Park is a key site along the Newtownabbey Way (See P58) providing a play park and footpaths alongside the sports facilities. The pavilion is available for private bookings, classes and events. Ever more families are becoming interested in discovering and uncovering their family history and tracing their roots. With this in mind, Antrim and Newtownabbey can provide a number of sources to help you in your search. Perhaps you are a taphophile, someone with an interest in cemeteries... in that case youâ&#x20AC;&#x2122;ll love Antrim and Newtownabbey. It has a treasure trove of fascinating graveyards, such as Mallusk Graveyard, the last resting place of several prominent United Irishmen, or take a look around the ancient headstones at Rashee Old Graveyard, near Ballyclare. GENEALOGY RESOURCES ACROSS COUNTY ANTRIM If you wish to delve into history and follow your ancestral path back through time, then there are several points of contact to help you unearth your family's past across the Borough. Maybe you have links in the Carnmoney area in particular? Sentry Hill houses a vast collection of photographs, manuscripts, letters and intriguing artefacts, many of which are on display in the house. The previous resident, William McKinney, was an authority on the history of local families in Carnmoney and carried out meticulous genealogical research on local families. Williamâ&#x20AC;&#x2122;s work can be a huge help to anyone researching family histories in the area and the staff at Sentry Hill are happy to assist with enquiries (See P21). Walking and cycling in Antrim and Newtownabbey means enjoying some of the most picturesque trails in Northern Ireland. Stepping out and pedalling down are great ways for the whole family to get active, have fun, and experience some of the most stunning sights and scenery anywhere in the country. Furthermore, it can all be done safely, along secure way-marked pathways and cycle routes. Take the Antrim Town Loop; four and a half leisurely miles (about 7 km) that guide you along the Six Mile Water River, into the beautiful 400-year old gardens of Antrim Castle Gardens and Clotworthy House. If you’re feeling more energetic, stride to the top of Carnmoney Hill. The climb through its ancient woodland may leave you breathless, but the wonderful views over Belfast Lough will make it all worthwhile. WALKING ROUTES ACROSS THE BOROUGH Stretching from the north-eastern shores of Lough Neagh and the slopes of Tardree, to the Belfast Hills and the shoreline of Belfast Lough, the Borough of Antrim and Newtownabbey is an ideal area to explore on foot. Steeped in folklore and set in tranquil countryside, the walking routes highlighted in this guide allow you to explore the rich natural and cultural heritage the Borough has to offer. These routes represent just some of the many walking possibilities that exist in the area; careful reading of maps will reveal many possibilities for all the family to enjoy. CRUMLIN GLEN 1.8 miles / 2.9 km CRUMLIN Rising to the east on the slopes of Divis Mountain, the Crumlin River has carved a short but deep glen here as it approaches the waters of Lough Neagh. The glen consists of an area of mixed woodland with a wide variety of trees, plants and birds. It is sign posted off the Mill Road in Crumlin, just before the railway bridge as you head out of the town. REA’S WOOD 1.8 miles / 2.9 km ANTRIM A National Nature Reserve located at the north-east corner of Lough Neagh, Rea's Wood is a great example of wet woodland and has a rich diversity of wildlife present. To get there, follow the signs to the Lough Shore Park off the Dublin Road in Antrim. On reaching the Park, turn left continuing to the car park that looks out over Lough Neagh. As you look over the water, Rea’s Wood lies to your left. SIX MILE WATER & MILL RACE TRAIL 6.2 miles / 10 km ANTRIM This linear walk along the banks of the Sixmilewater starts from the Lough Shore Park, Antrim which is signed off the Dublin Road. The total walking route is 10km, however the walk can be shortened by starting or stopping at any of the access points along the route, including Antrim town centre. TARDREE FOREST WALK 2.5 miles / 4 km PARKGATE One of Northern Irelandâ&#x20AC;&#x2122;s oldest forests, Tardree is a prominent feature on the M2 between Antrim and Templepatrick. The forest hosts a healthy wildlife population with numerous bird species present. The forest also provides a place of relaxation and recreation for many visitors, offering panoramic views over County Antrim and Lough Neagh. In Parkgate turn left onto Connor Road. After 5km turn right, following the forest sign. TOOME CANAL 1.2 miles / 2 km TOOME This is a 2km walk to the shores of Lough Neagh along the banks of the Toome Canal. On the right hand side are the remains of the old railway bridge over the Bann and there is a viewpoint providing panoramic views over the Lough. In Toome, turn left at the sign for canoe trail, the entrance is on the left. CARNMONEY HILL 3 miles / 4.8 km NEWTOWNABBEY This Woodland Trust managed site has recently been designated a Local Nature Reserve, which celebrates the value of this site for both people and wildlife. Walking trails through the site are available for all abilities, with some leading to the summit for spectacular views of Belfast Lough and beyond. Access via Knockenagh Avenue, off Doagh Road; parking available at the lay-by. MONKSTOWN WOOD 2.8 miles / 4.6 km NEWTOWNABBEY This Woodland Trust owned site is a gentle walk suitable for people of all abilities and the range of habitats will allow the visitor to appreciate the importance of natural open space within this densely populated area. The range of habitats is an important resource and provides a great transport corridor for our local wildlife. Parking and access off Monkstown Road, off Doagh Road. NEWTOWNABBEY WAY 9 miles / 14.5 km NEWTOWNABBEY This relatively new route runs from Global Point at Corr's Corner to the shores of Belfast Lough and links to NCN Route 93. The greenway passes through the grounds of Mossley Mill and continues through the Three Mile Water Park to the lough shore at Whiteabbey Village. From here, the traffic free Loughshore path takes you into Hazelbank Park, through Gideon’s Green and south to Jordanstown Loughshore Park and its facilities to the north. RANDALSTOWN VIADUCT WALKWAY & CYCLE PATH 1.7 miles / 2.7 km RANDALSTOWN The viaduct was constructed from random basalt in the late 18th century and has nine arches. The top of the Viaduct and part of the railway track have been converted into a walkway and cycle path leading from Station Road to New Street. This development provides spectacular views of Randalstown, the River Maine and the adjoining parkland of Shane’s Castle. ANTRIM TOWN LOOP 4.5 miles / 7.2 km ANTRIM Starting at Antrim Lough Shore Park, follow the pathway south through Reaâ&#x20AC;&#x2122;s Wood, then travel inland along Kirbyâ&#x20AC;&#x2122;s Lane until you reach the Six Mile Water River. Here a path takes you back into Antrim along a section of the Mill Race Trail. Cycle through the town to the Barbican Gate, then turn left into Antrim Castle Gardens, passing the Motte en-route to Clotworthy House. Cross the river at the Deer Park Bridge and follow the riverside path back to the Lough. LOUGHSHORE TRAIL 113 miles / 182 km LOUGH NEAGH This trail provides the unique opportunity to cycle around Lough Neagh, the largest freshwater lake in the British Isles. Incorporating over 25 major sites of interest including marinas, nature reserves, parks and sites of archaeological interest. There is also an option to cycle shorter linear routes of the trail. Starting at Antrim Forum, cyclists can pedal to Randalstown and Toome in one direction, or head south to Crumlin in the other direction. LOWER BANN CYCLE WAY 45 miles / 72 km START AT TOOME CANAL Beginning at Toome Canal, this trail takes you through picturesque scenery close to Portglenone Forest, an ancient woodland particularly famous for its Spring Bluebells. Following the River Bann from Toome, the Way takes you through Portglenone and up to the Barmouth in Castlerock where the river enters the Atlantic Ocean. Cyclists can also choose a shorter route, taking in the scenery of Lough Beg and the Lower Bann along the way. Shared use paths are a great way to get around Cyclists, please don’t expect to cycle at high speeds, by bike, but they’re also used by many other be prepared to slow down or stop if necessary, be careful at junctions, bends and entrances and give people. way to walkers and wheelchair users. When in the countryside, remember to Leave No Trace; dispose of waste properly, leave what you find and respect wildlife. Walkers, if you are walking with a dog, please keep it on a lead at all times. Bicycles are carried free on all train and Goldline bus services in Northern lreland, although it is important to check if there are any restrictions before you travel; visit www.translink.co.uk for further information. It’s hard to escape from water in Antrim and Newtownabbey. Water has shaped our landscape, powered our industries, moulded our agriculture and also provides a wonderful leisure resource for folks of all ages and inclinations to enjoy. Anglers holding a valid Rod Licence and appropriate permissions can get hooked on some of the most compelling game and coarse fishing to be enjoyed anywhere in the British Isles. But as well as rivers like the Six Mile Water, the Crumlin and Lower Bann, the Borough has a number of well-stocked fisheries, such as those at Ballyclare and Mossley Mill, all of which welcome anglers and beginners of all abilities. For those who take their pleasure on the water, the area offers canoeing and sailing, as well as cruises to Ram’s Island and other destinations around Lough Neagh. YOU CAN STAY IN THE ONLY COASTGUARD BOAT HOUSE ON BELFAST LOUGH. THE HERITAGE BUILDING HAS KEPT MUCH OF ITS HISTORICAL ATTRIBUTES, INCLUDING A WINDOW DATING FROM THE 1840s , ORIGINAL BEAMS AND BOAT HOUSE RIGGING. THE BOAT HOUSE CAN ALSO BE TRACED BACK TO THE DAYS OF THE UNITED IRISHMEN. COARSE FISHING Coarse fishing is available seasonally (except Sundays) on the Six Mile Water River (from Antrim Forum Leisure Centre downstream to Lough Neagh), and all year round on the River Bann. A coarse fishing rod licence covers the use of two rods. Please note that a Game rod licence is required on the Six Mile Water River â&#x20AC;&#x201C; this will only entitle you to use one rod. GAME FISHING Four rivers in Antrim and Newtownabbey provide game fishing from 1 March to 31 October, with the best fishing from April: River Maine enters Lough Neagh south of Randalstown and flows through the Shaneâ&#x20AC;&#x2122;s Castle Demesne. Six Mile Water River is famous for its trout fishing and also has salmon and dollaghan. It flows through or close to the communities of Ballynure, Ballyclare, Doagh, Parkgate, Templepatrick, Dunadry and Antrim into Lough Neagh. No Sunday fishing is allowed. Crumlin River flows west of Crumlin through Crumlin Glen to enter Lough Neagh. Angling stands are available in Crumlin Glen for improved accessibility. Lower Bann provides for game angling from the sluice gates at Toome downstream. All of the rivers hold excellent stocks of wild brown trout with salmon and dollaghan (the famous Lough Neagh migratory trout) entering these rivers from early August and providing excellent sport until the end of the season. Potterswall Reservoir also provides excellent game fishing. 30 Clonkeen Road, Randalstown, BT41 3JL 028 9447 2806 or 078 3400 5216 craigmorefishery@hotmail.co.uk www.craigmorefishery.co.uk Craigmore Fishery provides excellent fly fishing on a five acre, spring-fed lake set in the quiet countryside with scenic views of Lough Neagh. The fishery is stocked weekly with top quality rainbow trout. The fishery also offers a bait pond, hot food, canteen and accessible facilities. 115 Staffordstown Road, Randalstown, BT41 3LH 028 9447 8566 or 028 9447 2547 creevehouseinn@btconnect.com www.creevetroutfishery.com Creeve Trout Fishery is a family-run fishing lake where anglers and beginners of all abilities are welcome. Restocked on a weekly basis, the lake is set in a tranquil location surrounded by green fields and mature trees. Fly casting tuition can be booked and refreshments can be provided. Accessible facilities include an Anglerâ&#x20AC;&#x2122;s rest cabin, Fly rod and reel rental, boat hire and jetty. Mossley Mill, Newtownabbey, BT36 5QA 028 9034 0000 info@antrimandnewtownabbey.gov.uk visitantrimandnewtownabbey.com This unique 5.5 acre (2.2 hectare), brown trout fishery is set in the grounds of a restored nineteenth-century linen mill in Newtownabbey. The fishery is run on a partnership basis between the award-winning Three Mile Water Conservation and Angling Association and Antrim and Newtownabbey Borough Council. 21 Castletown Road, Ballynure, BT39 9PU 028 9303 8721 info@straidfishery.com www.straidfishery.com County Antrim's largest managed public 'pay & fish' fishery has three lakes: 20 acres of fly fishing for rainbow trout from boat/bank; a two-acre any-method lake for families only; and, a half-acre carp lake. Also, there's an on-site fly fishing school which caters for beginners to advanced anglers. 42 Breckenhill Road, Doagh, BT39 0TB 028 9334 0604 office@tildargfishery.co.uk Beautiful 17-acre lake stocked with rainbow trout and naturally-breeding brown trout. Boats are available to hire and include two wheelchair accessible boats (free to hire). The lodge has a rest room with a fire, kitchen facilities, toilets and a shop with confectionery, drinks and a range of fishing equipment to buy and rods for hire. There is also a bait pond, ideal for young anglers and lessons. MAKE A SPLASH CANOEING IN THE BOROUGH Antrim and Newtownabbey Borough Council has improved access for canoeists along the Six Mile Water River, making it a safer place to paddle. Facilities include the construction of canoe steps at Muckamore, the creation of access and egress points and an information point at Barbour’s Weir and life rings along the river. LOUGH NEAGH CANOE TRAIL Lough Neagh is the UK’s largest inland lake with a shoreline of over 90 miles/150km. Paddlers can explore the numerous bays and inlets around the Lough or the vast expanse of open water, whilst observing a diversity of wildlife and historical sites. LOWER BANN CANOE TRAIL Stretching from Lough Neagh to the Atlantic Ocean, this scenic 58km canoe trail along the River Bann offers canoeists a mix of tranquil waters and some faster flowing sections. The Lower Bann Canoe Trail links up with the Lough Neagh Trail at Toomebridge. Please visit www.canoeni.com for interactive maps and information on access points for all the above canoe trails. SET SAIL BOAT TRIPS IN THE BOROUGH Take to the open waters and experience Lough Neagh in style! For a memorable cruise why not board the 'Maid of Antrim' and explore the Lough in comfort. Or for something different, take a trip on the 'Island Warrior' and explore Ram's Island at your own leisure! The best way to discover Lough Neagh is to step on board the Maid of Antrim, which has recently been restored to its former glory. Departing from Antrim Lough Shore Park, passengers can avail of its one and two hour cruises in the lounge or open sun deck. A trip on the Maid of Antrim will be a memorable experience for adults and children alike. The Island Warrior is a licensed passenger boat that takes visitors to Ram’s Island (See P20). The boat trips are every Saturday in July and August. The boat leaves from Crumlin Marina at Sandy Bay between 12.30pm and 5.30pm with the last boat leaving the Island at 6pm. Evening and Sunday cruises to Ram’s Island can be organised by prior arrangement. Why not bring a picnic and enjoy an afternoon on Ram’s Island? The boat trips are subject to weather conditions so it is recommended to ring in advance. courses. In fact, the Hilton and Massereene courses are acknowledged as among the finest in Northern Ireland. Or if you fancy playing on a different type of green altogether, the world-renowned Jim Baker Stadium welcomes bowlers of all ages and abilities for fun and competitive play. What’s more, all of these activities are available in modern, well-equipped sports environments, where you’ll find great facilities, with professional supervision and coaching as required. This superb 18-hole golf course, designed by David Jones and David Feherty, has been acclaimed as Jones’ finest work. This challenging and picturesque 18-hole par 72 Championship Golf Parkland Course covers 140 acres of mature tree-lined fairways adjacent to the shores of Lough Neagh, with views as far as County Tyrone to the west. Massereene is a host club for many GUI and ILGU competitions, as it is a challenging but enjoyable course with easy access to all parts of Northern Ireland and only eight minutes from Belfast International Airport. Winner of the GGI ‘Hidden Gem’ award 2018 and due to co-host the N.I. Open in August 2019. Set in the rolling, green countryside around the bustling, traditional market town of Ballyclare, this parkland course makes use of the natural features of its landscape, in particular the local river and streams. The fairways are tree lined and as expected, accurate driving is required for a good score. A challenging parkland course designed to fit in with the natural rolling countryside of County Antrim. Its proximity to Belfast also makes it an ideal stop for a quick round with visitors based in the city. In addition to the course, there is a 20-bay, fully floodlit driving range, perfect if you want to get in a little practice. Jim Baker Bowling Stadium, the number one indoor bowls venue in Ireland, is open to bowlers of all ages and abilities for fun and competitive play. Burnfield Foot Golf is a wonderful 18 hole par 69 course situated in Newtownabbey. Fun for all the family, sports teams, youth clubs, stag, hen parties and more. Advance booking recommended. When it comes to getting out and getting active, our visitors are simply spoilt for choice. Whether your idea of relaxation is an intensive two-hour gym workout or taking aim in archery, there's more than enough to keep you going across the Borough. Perhaps you feel the need for speed; squeeze yourself into a kart and experience life in the fast lane, or even take to the roads on a custom Harley Davidson motorcycle. The region’s main towns have public leisure facilities with classes where you can work out or swim to keep fit and trim. Or if you prefer the great outdoors, simply combine your keep fit regime with the wide open spaces at the many outdoor gyms in the Borough. Lough Road, Antrim, BT41 4DQ 028 9446 4131 forum@antrimandnewtownabbey.gov.uk visitantrimandnewtownabbey.com Antrim Forum offers fun for all the family with swimming pools, ten pin bowling, Cavemen Capers soft play, state of the art fitness suite overlooking the beautiful Antrim Castle Gardens and a wide range of activities including football, tennis and basketball. Also on site is the Antrim Forum Spa with state-of-the-art facilities to ensure you can thoroughly relax (See P106). 585 Doagh Road, Newtownabbey, BT36 5RZ 028 9084 8287 ballyearl@antrimandnewtownabbey.gov.uk visitantrimandnewtownabbey.com A unique location which hosts, sport and recreation, arts and crafts and business meetings. The fitness suite at Ballyearl has panoramic views across the driving range and also boasts an open plan gym. There are a range of fitness classes, squash courts and a 9-hole golf course on site. Main Street, Crumlin, BT29 4UP 028 9448 1973 crumlinlc@antrimandnewtownabbey.gov.uk visitantrimandnewtownabbey.com This new multi-activity sports hub provides modern state-of-the-art facilities which everyone can enjoy. 3G pitches, sports halls, fitness suites, conference suite/dance studio and play park. Ballynure Road, Ballyclare, BT39 9YU 028 9334 1818 sixmile@antrimandnewtownabbey.gov.uk visitantrimandnewtownabbey.com Located in the heart of Ballyclare, this state of the art centre offers some of the finest leisure and fitness facilities in Northern Ireland. The leisure swimming pool provides fun for all the family with a slide, lazy river & other features as well as a childrenâ&#x20AC;&#x2122;s splash pool. Fitness suite, sauna, steam room, spa pool and sports hall providing a wide range of activities and classes for all. Church Road, Newtownabbey, BT36 7LJ 028 9086 1211 valley@antrimandnewtownabbey.gov.uk visitantrimandnewtownabbey.com Valley Leisure Centre offers a superb range of leisure and sporting activities, including swimming, football, table tennis, badminton, dance, squash, basketball, gymnastics, cheerleading, gaelic football, hockey, roller hockey, powerlifting, gym classes and V36 play park. Shane’s Castle, Randalstown, BT41 2AD 077 7463 6254 escarmouche1@hotmail.com www.escarmouche.com As Ireland’s largest paintball and multi-activity park, boasting two intense close-quarter, forest-based games, five Dynamic Urban Zones, the Gauntlet Assault Course, Zorb Football and many more activities. Escarmouche will make sure your day is an experience you will want to repeat over and over again. Tailor made half day and full day packages available. 028 9334 0311 info@ballyclareactivitytrail.com www.ballyclareactivitytrail.com Ballyclare Activity Trail can offer three choices of accommodation, three places to eat and a variety of places to have fun including fishing, archery, golf, walking, orienteering, outdoor activities, horse-riding, indoor soccer and go-karting. You can also visit a beautiful nursery garden and an organic farm. Our goal is to provide you with either a great day out or if you want to stay longer, a wonderful few days of fun. Doagh Business Park, 11 Kilbride Road Ballyclare, BT39 0QA 028 9334 2777 info@need4speedkarting.com www.need4speedkarting.com An indoor karting track that is ideal for a fun-filled day out. Each booking has exclusive use of the track and premises. Part of the Ballyclare Activity Trail. 51 Green Road, Ballyclare, BT39 9PH 028 9332 4551 www.thesoccershed.co.uk An indoor leisure facility that offers two indoor 3G football pitches; ideal for football matches, soccer tournaments, rugby training, fitness classes, childrenâ&#x20AC;&#x2122;s birthday parties and corporate events. Part of the Ballyclare Activity Trail. 51 Green Road, Ballyclare, BT39 9PH 028 9303 7030 bookings@megaleisureni.com www.megaleisureni.com Borderline Combat offers fast paced Airsoft tactical team play. It is one of the fastest growing sports in the UK and offers an experience unlike any other. The site has both Indoor & Outdoor play areas and an on-site cafe. Free Wi-Fi and toilet facilities available. Wheelchair accessible and fully UKARA registered and insured. Ideal for private shoots, stag parties or company corporate days out. 51 Green Road, Ballyclare, BT39 9PH 028 9303 7030 bookings@megaleisureni.com www.nerfworx.com Let off steam in a purpose built arena and blast your way to victory at the only official NERF site in Northern Ireland! The venue provides a fun packed, adventure filled experience for children aged 6 and over. The site has free Wi-Fi, on-site catering and parking. Birthday parties and youth groups can also be accommodated. Take the family for a day out in Antrim and Newtownabbey. Whether it’s an outdoor activity centre or a visit to a fun farm, there’s plenty to keep everyone active and entertained. If the weather doesn’t play fair, you can always continue the fun indoors at one of our great leisure complexes. Young ones can get up close to a range of animals at Clementsmount Open Farm, while older children will enjoy taking part in adventure activities, such as canoeing on the Lower Bann. For something completely different, why not get up close to an owl at the World of Owls Centre in Randalstown Forest? Afterwards, pick a flick and chill out at one of the Borough’s cinema complexes or tuck into a hearty meal at a family-friendly restaurant; memories are made of this! 50 Ballydonaghy Road, Crumlin, BT29 4ER 028 9442 2824 info@clementsmountfunfarm.co.uk www.clementsmountfunfarm.co.uk Ideal spot to stop for lots of fun, for all the family. Great indoor and outdoor activities such as the Petting barn, Pedal go-karts, Soft play area, Trim trail, Pony rides and much, much more. You will get the chance to meet and hold some of the animals. School groups and birthday parties are welcome. Just give us a call and we can make arrangements to meet your needs. 12 Ballylagan Road, Straid, Ballyclare, BT39 9NF 028 9332 2867 or 028 9332 2129 info@ballylagan.com www.ballylagan.com Ballylagan Organic Farm has been a pioneer in sustainable farming for over 25 years. Much of the energy we use and food we sell is produced on the farm. For the full organic experience visit our farm shop and tea room. Top off your visit with a leisurely walk round our farm trail where you can experience the changing seasons in parts of the countryside normally hidden to the public. Also look out for new arrivals such as lambs and piglets. Part of the Ballyclare Activity Trail. 32 Mount Shalgus Lane, Randalstown Forest, BT41 3LE 028 9447 2307 admin@worldofowls.com www.worldofowls.com Northern Ireland's only Owl, Bird of Prey and Exotic Animal Sanctuary. One of the largest collections of owls in Europe. A zoological registered charity open to the public, working to benefit education and conservation for Northern Ireland. With dedicated and fully trained voluntary staff we are situated within the very beautiful Randalstown Forest. 18 Knowehead Road, Ballyclare, BT39 0BX 028 9083 0649 laurelview01@btinternet.com www.laurelview.co.uk Our family-run activity centre provides accredited and qualified horse riding instruction. Riding in indoor arenas when the weather is inclement, with opportunities to take advantage of the hacking track when the sun comes out. Call us to book a horse riding lesson. Minimum age of 6 years applies. Part of the Ballyclare Activity Trail. 10 Ballydrummaul Road, Randalstown, BT41 3JD 028 9447 8516 paul@mackenziesequestriancentre.com www.mackenziesequestriancentre.com MacKenzieâ&#x20AC;&#x2122;s Equestrian Centre is DAERA approved and family run in a rural setting. The centre provides lessons for all ages (starting at 5+) and offers riding and stable management lessons, from beginners to the more experienced. Indoor arenas of international size are available for hire with full set up of show jumps and regular shows running. The Junction Retail and Leisure Park, Ballymena Road, Antrim, BT41 4LL 028 9442 9111 info@thejunctionshopping.com www.thejunctionshopping.com If you have always fancied having a go at driving a construction vehicle, now is your chance. JCB Young Drivers Zone boasts over 50 ride-on JCB vehicles for 2 to 8 year olds with a specially designed track featuring bridges, humps, roundabouts and overtaking lanes. Antrim Forum, Lough Road, Antrim, BT41 4DQ 028 9446 4131 forum@antrimandnewtownabbey.gov.uk www.antrimandnewtownabbey.gov.uk/ antrimforum Featuring six lanes of outer space ten pin bin bowling and special UV lighting you'll be amazed at the impressive galactic themed, glow-in-the-dark bowling alley! Each lane caters for up to six people and is ideal for children's birthday parties, a corporate night out or just a fun night with friends. Also available for private hire. 3-5 Glenwell Road, Glengormley, BT36 7RF 028 9084 8323 info@glengormleysportsbowl.com www.glengormleysportsbowl.com Glengormley Sportsbowl, in the heart of Glengormley, houses 16 lanes of automated tenpin bowling with automatic bumpers available for young children. There is an indoor karting area for children and a variety of video games and pool tables on site too. The cafĂŠ on site provides a variety of soft drinks and snacks as well as hot food. Great for children's birthday parties, it's also ideal for a fun day out for all the family. With its rich and varied cultural heritage, it is hardly surprising that Antrim and Newtownabbey supports a vibrant contemporary arts programme. The Borough is home to no less than three theatrical venues; Theatre at The Mill, The Old Courthouse and Courtyard Theatre. Whatever your taste, you will find something to stimulate the mind and delight the senses, whether it be drama, opera, comedy or music. There is also a range of contemporary gallery spaces, with a lively seasonal range of courses and classes for adults and children at Antrim Castle Gardens & Clotworthy House, Ballyearl Arts & Leisure Centre and Museum at The Mill. People in Antrim and Newtownabbey know how to enjoy themselves and they love visitors to join in too. Itâ&#x20AC;&#x2122;s not surprising to find a healthy programme of events and festivals in Antrim and Newtownabbey, from community celebrations with a local theme, to larger festivals that embrace the whole Borough and beyond. If you have a taste for local speciality foods and handmade crafts, then a visit to one of our markets is a must. Held seasonally across the Borough, with displays, live music and family entertainment. For more information on events and markets across the Borough: visitantrimandnewtownabbey.com Also, things take a magical twist in the award winning Antrim Castle Gardens every December, when it plays host to Northern Ireland's Premier Christmas event the Enchanted Winter Garden. Explore the captivating sights and sounds of the gardens and historic buildings including the mystical Wonderland Wood brought to life with dazzling lights and flames as well as magical fairies and elves. Let’s face it, we all deserve to indulge ourselves just a little, every now and again. So what’s your fancy... perhaps you’d like to spend an afternoon shopping for that fashion item you’ve had your eye on? Maybe there’s a new blockbuster cinema release that you really want to see or perhaps you simply want to chill out a few hours, relaxing in the soothing balm of a luxurious spa. Whatever tickles your fancy, you’ll find it here in Antrim and Newtownabbey; jaw-dropping shopping, cool, classy cinemas, inspirational spas. In fact, everything to make sure that you not only look good and feel good, but that you have fun too! Ballymena Road, Antrim, BT41 4LL 028 9442 9111 info@thejunctionshopping.com www.thejunctionshopping.com Shopping and entertainment donâ&#x20AC;&#x2122;t get bigger than this. The Junction is the go-to retail and leisure destination in Northern Ireland. A playground for visitors of all ages. Shopping is only one part of The Junction experience. As well as over 30 retailers, including M&S, Next, Gap, Homebase and Asda, we offer a wide range of places to eat and drink, activities for the kids and a 10-screen Omniplex cinema. There is more than enough to keep the whole family entertained. A great day out on a grand scale. Longwood Rd, Newtownabbey, BT37 9UH 028 9086 8018 info@abbeycentreshopping.co.uk www.abbeycentreshopping.co.uk Abbey Centre offers shoppers an impressive reason to retail with over 70 stores, up to four hours free parking and free Wi-Fi. Indulge in some retail therapy in NI's largest Next, our designer Dunnes Stores and super Primark. Dine in South African style in Nando's and while away the day with late weeknight shopping until 9pm. With everything from your local butcher to your local locksmith, we are your covered high street. Experience your Abbey Centre today - fashion and food to suit your lifestyle. Feel right at home. Market Square, Antrim BT41 4DN 028 9442 8269 info@castlemallantrim.com www.castlemallantrim.com Castle Mall is located in the heart of Antrim town centre, offering free car parking for up to 3 hours. Many familiar high street shops are located within the centre including Post Office, Gordons Chemist, Poundstretcher, Choices, New Look, Superdrug, Specsavers, Holland & Barrett, Hurrells Electrical, Shoe Zone, Timpsons, Poundland, Card Factory and Classique Coffee Shop. OMNIPLEX MAXX ANTRIM The Junction Retail and Leisure Park, Ballymena Road, Antrim, BT41 4LL 028 9446 0658 www.omniplex.ie Boasting the latest in projection and digital sound technology, Omniplex cinemas have become the standard bearer for multiplex facilities. Stadium seating in all screens with superbly comfortable seats and more than ample leg room provide patrons with a first-class environment to watch the latest blockbuster movies. At our concessions areas choose from freshly made popcorn, ice-cold drinks and delicious Pick 'Nâ&#x20AC;&#x2122; Mix. MOVIE HOUSE GLENGORMLEY Glenwell Road, Glengormley, BT36 7RF 028 9083 3424 www.moviehouse.co.uk Movie House Glengormley boasts six screens featuring big American seats, the best in sound and visual quality and free parking. With popular family matinees and two evening performances every day, the Movie House provides great value entertainment every day of the week. Make sure to check out special price promotions on the cinema website. YOU CAN TASTE THE BEST OF THE LOUGH BY BOOKING ON TO ONE OF LOUGH NEAGH PARTNERSHIPS FOOD N CRAIC TOURS. SEE PAGE 27 FOR INFORMATION AND TO BOOK. Maybe you’re here for a golfing trip or to attend a business conference. It could be that you’re interested in the Borough’s rich architectural heritage. Perhaps you’re here to get active outdoors, or enjoy some watersports. 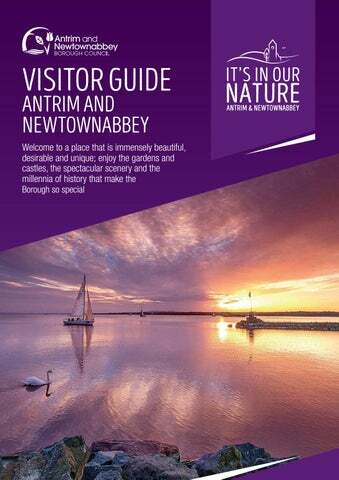 Whatever draws you to Antrim and Newtownabbey, you can be sure that you will find a hotel, guest house, B&B or self catering accommodation that offers a warm welcome, exceeds your expectations and goes easy on your pocket. You see, it’s in our nature to be hospitable. It’s in our nature to offer our friendship. It’s in our nature to make you feel at home. ACCOMMODATION ACROSS THE BOROUGH There is a vast range of accommodation facilities available across the Borough; • Hotels • Bed & Breakfast • Guesthouses • Self Catering • Guest Accommodation • Campus Accommodation • Caravan Parks Whatever the purpose of your visit, you will find yourself most welcome! 20-22 Main Street, Toomebridge, BT41 3GR 028 7965 0800 info@oneillarms.com www.oneillarms.com The O’Neill Arms Country House Hotel is now part of the Arbutus Hospitality Company. Situated between Belfast and Derry/ Londonderry, it is ideally suited for both leisure and business. With 11 unique en-suite bedrooms, 4 function and meeting rooms we can offer everything from private and coach parties to business conferencing and weddings. 115 Staffordstown Road, Randalstown, BT41 3LH 028 9447 2547 creevehouseinn@btconnect.com This modernised, spacious 200-year old guesthouse is within walking distance of Lough Neagh. All eight en-suite bedrooms have tea/coffee making facilities and colour TV. A licensed bar is on the premises and evening meals are available on request. Special rates for children. 12 Ballylagan Road, Straid, Ballyclare, BT39 9NF 028 9332 2129 info@ ballylagan.com www.ballylagan.com Guests are invited to relax in our 19th-century farmhouse, with large, elegantly styled bedrooms offering log fires, goose down duvets and organic bed linen and towels. 21 Ingledene, Templepatrick, Co. Antrim, BT39 0JN 077 7331 7735 mikebaler@btinternet.com Booking.com "Ingledene" A luxury, spacious detached 4 bedroom family residence, located in the quiet Ingledene Cul-de-sac nestled in the quaint village of Templepatrick. 25 Killead Road, Aldergrove, Crumlin, Co. Antrim, BT29 4EL 075 7901 8963 info@killeadhouse.com www.killeadhouse.com Situated just 1 mile from Belfast International Airport, Killead House self-catering apartment is conveniently located for visitors wishing to explore Northern Ireland or a comfortable stay before or after a trip abroad. Facilities include open plan living area, 50 inch smart TV, free Wi-Fi and parking. Spend an hour or so browsing through the displays in the Museum at The Mill. You’ll gain a fascinating insight to the textile industry and the effect it had on the lives of those who worked in it. Enjoy refreshments in the café while you’re there. 11.00 am Why not visit Sentry Hill, a perfectly-preserved 19th century farm house that gives us a glimpse into a rural way of life that has long disappeared. It’s also the ancestral home of a remarkable family of writers, collectors and radical thinkers... the McKinneys. Or, call into Patterson’s Spade Mill, a National Trust property. It’s the last water-driven spade mill still working in the British Isles. You can take part in a tour and watch as a spade is made... it’s a bit like stepping back into the Industrial Revolution. 1.00 pm Head to Antrim Castle Gardens and Clotworthy House. The 400-year old gardens have been sensitively restored, including the beautiful Anglo Dutch style canals and ponds that are unique in Northern Ireland. The Gardens have a lovely café for lunch. 3.30 pm Explore Pogue’s Entry Historical Cottage to find out about the lives of ordinary Irish country folk in the mid to late 1800s. 4.30 pm Visit the 10th-century Antrim Round Tower, built as part of a monastic settlement. 5.30 pm Make your way back to your accommodation and finish the day by going to a show at one of the theatres in the Borough. Visit World of Owls at Randalstown Forest, Northern Ireland’s only Owl conservation centre, which houses owls from all around the world. 11.30 am Whether it’s wet or dry, children will find lots You’ll soon find out who your friends really are! to do at Clementsmount Fun Farm. They’ll get the chance to see, meet and hold some of the animals that live on the farm. Afterwards, everyone can enjoy lunch in the tearoom for some fresh, home cooked treats. 2.00 pm Take a trip across Lough Neagh on board the Island Warrior, and disembark to explore Ram’s Island for a few hours. Just don’t get lost! 4.30 pm Time for mum and dad to enjoy an hour’s shopping at The Junction Retail and Leisure Park. With top brands at discount prices, there’s something for every member of the family. Start the day off with a round of golf at Allen Park Golf Course, or practise your swing on the driving range. 11.00 am Get an adrenalin high at Escarmouche Paintball. You’ll soon find out who your friends really are! 1.00 pm Grab a bite of pub grub in Ballyclare town centre. 2.00 pm Join the Ballyclare Activity Trail, and shift up a gear with high speed thrills on the track at Need 4 Speed Karting. 4.00 pm Try your hand at target practice with archery at Breckenhill. 5.30 pm Relax in the luxurious spa at Dunamoy Cottages. 5.30 pm Make your way back to your accommodation, then enjoy a family night out at the cinema. 6.30 pm Make your way back to your accommodation, dress up in your glad rags and head out for dinner and a night’s craic at Antrim and Newtownabbey’s lively pubs. Antrim and Newtownabbey is served by some of the best road, rail and air transportation links and systems in Northern Ireland and is only 20 minutes from the regionâ&#x20AC;&#x2122;s capital city, Belfast. It is bisected by the M2 Motorway, there is quick, safe access to all the major points of entry, whether it be Belfast harbour, the port of Larne, Belfast International Airport or George Best Belfast City Airport. What is more, some of the most fascinating and jaw-dropping attractions to be found anywhere are only a short drive away. 30 minute drive from Ballyclare One of Northern Ireland’s newest visitor attractions, the Gobbins Cliff Path skirts the bottom of the Gobbins cliffs of Islandmagee, on the east Antrim coast. Encompassing tubular and suspension bridges, a carved tunnel and staircases, the path offers a white-knuckle walk across one of Ulster’s most dramatic coastlines. 1 hour drive from Antrim town Experts say that the huge rock columns that form Northern Ireland's most famous visitor attraction came from crystallized lava that erupted 60 million years ago; however you may prefer the story that the giant, Finn McCool, fancied a lady giant on the Scottish island of Staffa and built these stepping stones across the waters to reach her. The Causeway Coastal Route starts at Jordanstown Loughshore Park Did you know that one of the Top 5 Road Trips in the world is within an easy drive Antrim and Newtownabbey? Running from Northern Ireland’s capital city Belfast, to the historic walled city of Derry/ Londonderry, the route is an ever changing tapestry of scenery and colours, set against a dramatic coastal backdrop that will take your breath away. 10 minute drive from Glengormley A 'must see' on any trip to Belfast, Titanic Belfast is a truly stunning building that tells the Titanic story in a thrilling, moving and compelling way. It delivers a full-on, immersion voyage through time and experience, through triumph and tragedy, using the very latest interactive technology to bring the Harland & Wolff shipyard and its most famous creation, RMS Titanic, back to life.